William McKinley was the 25th President of the United States who served in office from March 4, 1897 to September 14, 1901. What was the life of William McKinley like? The short biography of President William McKinley covers important information and facts about his early life, his family, career and the famous events and achievements of his political life. Our short biography of William McKinley provides an interesting and easy way to learn about the life of the President. The following important facts provide a fast overview of important facts about President William McKinley. Facts and Info: William McKinley was the 25th president of America and was assassinated by anarchist Leon Czolgosz. During his term in office America became a world power for the first time and president McKinley led the US during the Spanish-American War. For additional info refer to 20 Facts about William McKinley. Facts and Info: William McKinley was born on January 29, 1843 in Niles, Ohio. William McKinley, Jr. was named after his father and he dropped the “junior” on his father’s death. William McKinley was of Scots-Irish and English descent. He was assassinated on September 14, 1901 in Buffalo, New York. Facts and Info: The career of William McKinley included the roles of Lawyer, Politician and Statesman. McKinley received a good education and attended the Albany Law School in New York. He became the 25th president of America in 1897 and served until his assassination in 1901. Facts and Info: William McKinley married Ida Saxton on January 25, 1871. They had 2 children whose names were Katherine and Ida. Ida suffered with various illnesses and was constantly cared for and supported by her husband ensuring her dignity and her comfort. Facts and Info: William McKinley belonged to the Republican Political Party. He was 54 years old when he was inaugurated as the 25th president. Inauguration is a president's swearing-in ceremony. G Hobert and T. Roosevelt stood as Vice presidents. For additional facts refer to his Presidential Cabinet members. Short Biography of William McKinley: What he was like! Facts and Info: William McKinley was 5 feet 7 inches tall in height, had a brawny physique and weighed approximately 200 lbs. He had brown hair, grey-blue eyes with bushy eyebrows and a fair complexion. During political campaigns he wore a red carnation in his buttonhole for good luck. He had intended to become a Methodist minister but became a hero of the Civil War and Colonel Rutherford B Hayes became his lifelong friend and mentor. Facts and Info: During his lifetime he played a key role in important events of the era. 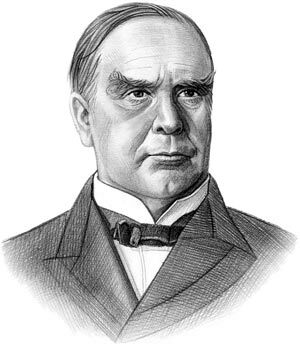 William McKinley was instrumental in leading the nation during the Spanish-American War of 1898. He oversaw the Annexation of Hawaii which marked the end of a long internal struggle between native Hawaiians and white American businessmen for control of the Hawaiian government. The US helped to suppress the Boxer Rebellion and called for an expanded Open Door policy allowing full trade with all of China. Facts and Info: The William McKinley assassination occurred on September 6, 1901, inside the Temple of Music which was part of the Pan-American Exposition in Buffalo, New York. He was shot twice by an anarchist named Leon Czolgosz only moments after handing a girl his lucky red carnation. He died on September 14, 1901 in Buffalo, New York and may have been saved if doctors had known where the bullet was lodged. In 1907, Buffalo dedicated a 96-foot tall marble obelisk in Niagara Square to McKinley's memory. The short biography of William McKinley provides a fast overview of the key facts and events about his life and the accomplishments of his presidential term in office. The following William McKinley video enables you to sit back and listen to the history of his personal and political life - a useful educational resource for kids, children and schools learning about the life of President William McKinley.